this vignette asked how I got the Burberry fabric (shown in my previous post) for $7/yard. Good question! Denver Fabrics used to have a larger selection of Burberry fabric than what they've currently got. The prices on the wool coatings varied in a way that didn't make sense really; some, including the plaid grey colorway, were as low as $7/yard. I assumed it must have been a typo, so I quickly ordered some before they could change it. This was back in June 2008. How adorable is this Alexander Henry cotton print? It's called Perfect Pattern, and it's available at Purl Soho, among other places. 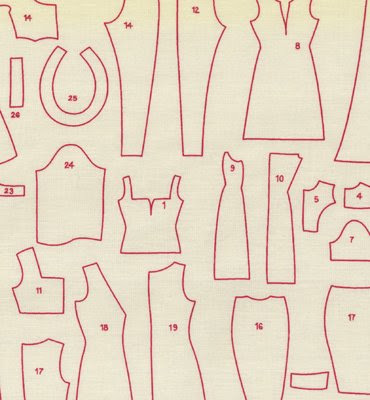 How great would this be for a sewing machine cover? That fabric is so cute!!!! Thanks for the Denver Fabric link. Never looked there before. I know ! Isn't this fabulous? I have this coming in for the stores too. Love that pattern fabric. One of these days I'm going to check out Purl Soho in person. That fabric is adorable! The sewing machine cover is a great idea! LOL! At first I thought you were showing us the pieces to the coat you were making with your plaid fabric. Really cute fabric! That fabric is way too cute! :-D I love it. Indeed that is the perfect fabric to make assesories for the sewing area. Great! I´ve seen may coats in such nice plaids in the stores while shopping yesterday. So you will be up to date whith a high-class wintercoat.